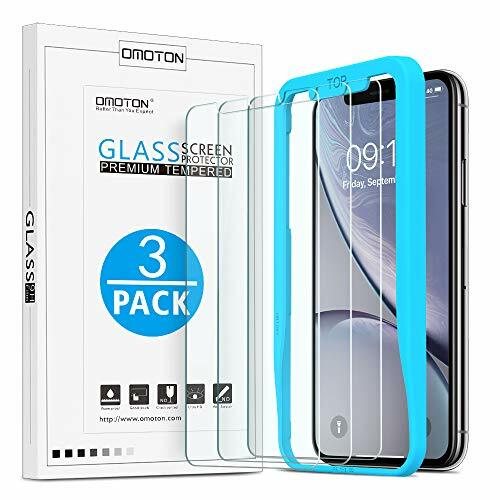 OMOTON: High Definition Tempered Glass Screen ProtectorScratch Resistant, 2.5D Round Edge, Providing Maximum Protection for Your DeviceSpecial DesignOnly Fits for Apple New iPhone XR 2018, NOT Fit for Any Other Cellphones.Scratch Terminator 9H Hardness, harder than a knife's blade. It is not exaggerated to say this screen protector is terminator to any possible scratches by keys, knife or other sharp objects.High Transparency 99.99% transparency of this tempered glass screen protector preserves the original screen brightness. You can enjoy a great viewing experience with more brightness and less glare. Smudges and Fingerprint Resistant The hydrophobic oleophobic coating largely reduces smudges and fingerprint on your New iPhone XR 2018. You keep your screen clean by a simple wipe.Package Includes: 3 × Screen Protector for New iPhone XR 20181 × Guide Frame1 × Accessories KitNotice: New iPhone XR screen has a rounded edge which is why this 2.5D screen protector cannot cover it completely and will leave a tiny margin of the screen uncovered.